The Budget SLP: Make Your Pacing Boards Today! Everyone should have a set of pacing boards! I was reminded of my pacing boards when I read Guest Post: Pacing Boards at Activity Tailor this summer. The post, a must-read, by Jennifer at NW Speech Therapy, has some wonderful tips for using pacing boards. AND, she has a link to her FREE printable pacing boards at her TpT store. I was first introduced to the term "Pacing Board" in 1994 when reading Communication Skills in Children with Down Syndrome by Libby Kumin. I had occasionally used blocks or other objects to demonstrate syllabication. Libby Kumin suggested using pacing boards as visuals to increase phrase length from one to two words. My four pacing boards were laminated rectangles cut from file folders containing two, three, four, or five black construction paper squares. They hung on a ring in my therapy room for more than 20 years and were usually used for syllabication, to demonstrate phonological processes, and to visualize the number of words in phrases or sentences. 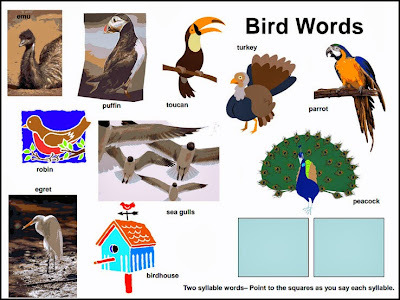 My Bird Words Activity has a pacing board on both pages. Over the years, I did get creative and make boards to match themes or topics (i.e., a pumpkin pacing board in the fall and snowballs in the winter). However, my basic pacing boards were always ready to use! Pace-Out-Your-Speech at Early Intervention Speech Therapy has more great suggestions for using pacing boards. Check out her PacingBoard Follow-up with Pictures. Download the PacingBoard Ladybug Speech Freebie from SLPrunner. Pacing board ideas and a cute video clip, Keeping Pace, are found at lunchbuddiesplus. Kumin, Libby. Communication skills in children with Down syndrome: a guide for parents. Rockville, MD: Woodbine House, 1994. Print. I love to use pacing boards in therapy. I've also used favorite kids character stickers for some of my kids.